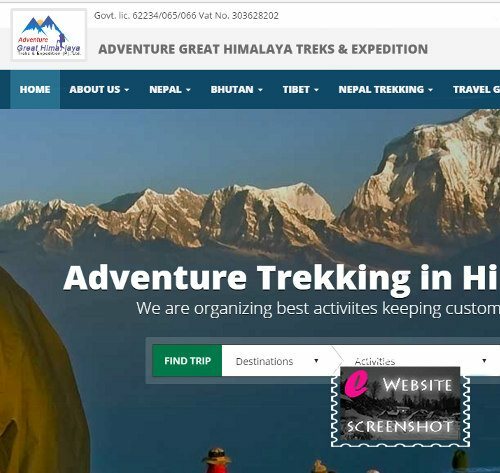 We are Nepalese government registered Nepal Trekking , hiking and adventure travel tour company, specialist for Everest Base camp Trek, Annapurna trekking and more Trekking in Himalaya Adventure Great Himalaya Treks & Expeditions probably one of the few adventure company offering best and quality services to our interested guests and travelers, joining with us in our unique adventure and cultural holidays. We offer wide range of adventure and leisure tour destination accompanied by expert guides-staff and escorts with full knowledge of culture-history-flora / fauna, medical and first aid. Travel with Adventure Great Himalaya Treks & Expeditions will be enjoyable, memorable in the harmony of friendly guides and staff who takes full care for your safe and health when traveling with us. Besides taking immense safety of our clients, we are totally committed with welfare of our staff-guides and porters as well providing health care-medical insurance-trip wages and bonus in making the trip successful and enjoyable.